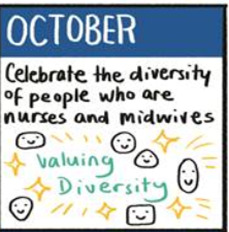 The October Transforming Perceptions of Nursing and Midwifery 30 day challenge is all about diversity. With this challenge in mind Bev Matthews and I facilitated an interactive session on the subject recently with Horizons colleagues. Horizons are one of the most inclusive teams I have had the pleasure to work in. We are a diverse team, specialists in our fields. What unites us as a team is our vision, values, and versatility. We are all different however our differences help to enrich our team, skills and expertise. How do we value difference? This was a very effective way of capturing what diversity means to people. Our different likes and dislikes, thought processes help to shape us and to make us who we are. Camilla's quote was a great way to sum up cognitive diversity (how we approach problems and think about things). The session started by discussing this month's 30 day challenge and the positive impact it has had on the nursing and midwifery ambassadors. One of the nurse ambassadors Joanne Mohammed has written a very inspirational and poignant blog which helped us set the scene for the challenge. We wanted the group to feel comfortable and feel able to speak openly and freely. The informal facilitation technique we used was a variation of 1-2- 4- All. This technique breaks down discussions into steps that allow participants to contribute individually and work together. We asked the group the to work firstly on their own and then in pairs and to define the two key questions. We then asked the pairs to feedback their definitions to the group and we had an in-depth group conversation. We discussed that we are all different with varied backgrounds, cultures, ages, education, race, sexuality and religions. We found that defining diversity is quite a personal subject. However the fundamental essence from the session was that embracing difference is the key to diversity. The consensus was that difference is something that is to be celebrated. The team were really keen on the emphasis of the individual. It’s imperative that we acknowledge the individual when thinking about diversity and difference. Acknowledging the individual is vital in all our working lives but none more so in frontline facing roles. Nurses and midwives understand the huge importance of tailoring their care and approach to suit individuals on a daily basis. Every patient is unique in their needs and treatment requirements. I live with a long term condition and have required in-patient and outpatient care since 2012. I fully understand and appreciate how it feels to be treated as an individual and not to be seen as just another patient. The team came up with some strong ideas, another contribution that really stood out was the thought that diversity humanises us. Through diversity we overcome any negative biases and stereotypes of those that are different to us. Diversity enables us to open dialogue and embrace our differences. It’s our varied life experiences and differences that help us to work together and build successful teams. Let’s keep growing and learning from each other and most importantly appreciating diversity and difference. I think it’s time to make a cup of tea! Transforming Perceptions of Nursing and Midwifery is a national campaign which focuses on celebrating the diverse workforce, reigniting pride in the professions and a focus on recruitment and retention. Look beyond your usual connections and include people from as many diverse backgrounds as possible be it gender, race, age, disability, sexuality. 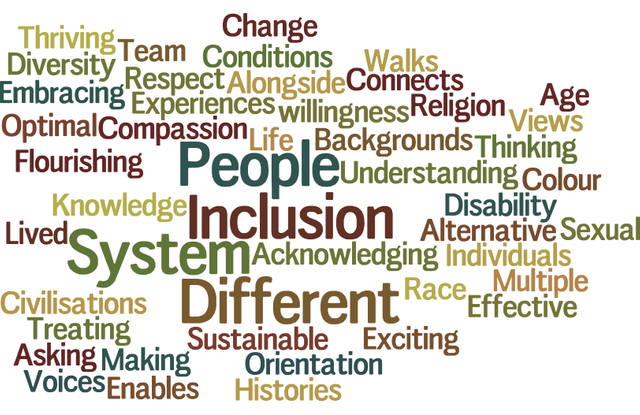 Reflections for the challenge: What is the difference between inclusion and diversity? Do you and your colleagues have a shared understanding of what diversity and inclusion means and what is involved in achieving inclusion? For more information on the October Challenge please visit the Perceptions Platform. Please also see Bev’s blog on the challenge. If you would like to sign up to become an ambassador to the Transforming Perceptions of Nursing and Midwifery programme this is the link.